In 1926 Lyons had become convinced that progressing to motor car body manufacturing was necessary if the company was to advance, and coincident with a move to larger premises at Cocker Street in Blackpool, he advertised in Midlands newspapers for a person with suitable skills o get such a project off the ground. By great good fortune Cyril Holland answered the advertisement (mostly out of curiosity, it appears) and he was immediately hired by Lyons, who could see that he was little short of a godsend. 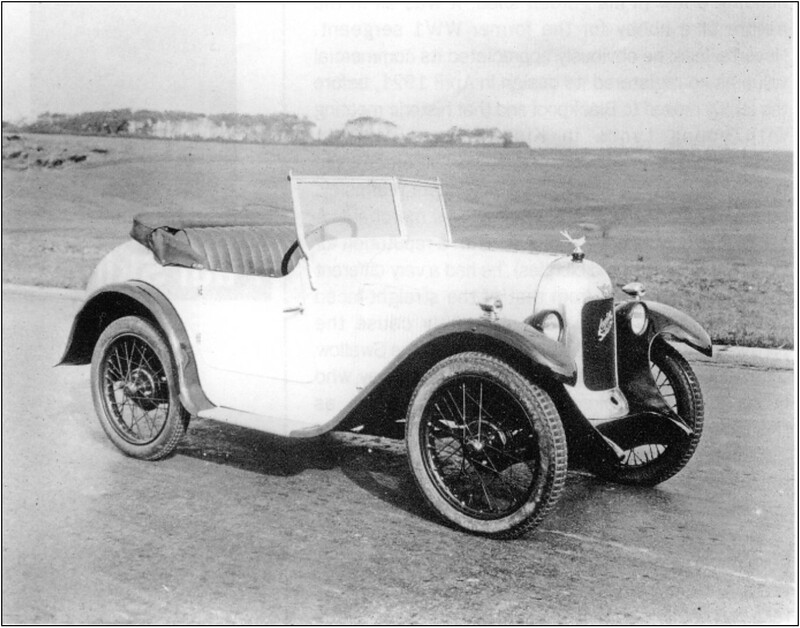 Aged 34, Holland had served an apprenticeship at Lanchester and had become skilled at body making: he was then with Mead & Deakin, which made bodies for Rhode cars. Wrote Lyons in his unpublished memoirs some 35 years later. "He said if we could give him a sketch, he could frame up a body with the appropriate jigs for making the panels." 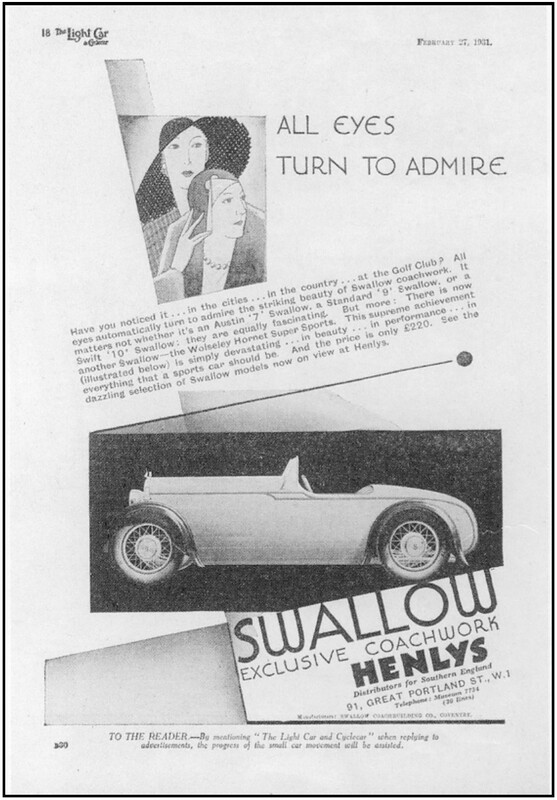 Hol land, it seemed, could make a reality the Swallow-bodied Austin Seven which Lyons was intent on producing. And so it transpired, with Lyons expressing his delight at the way Holland could, with minimum guidance. produce what he had in his mind's eye. 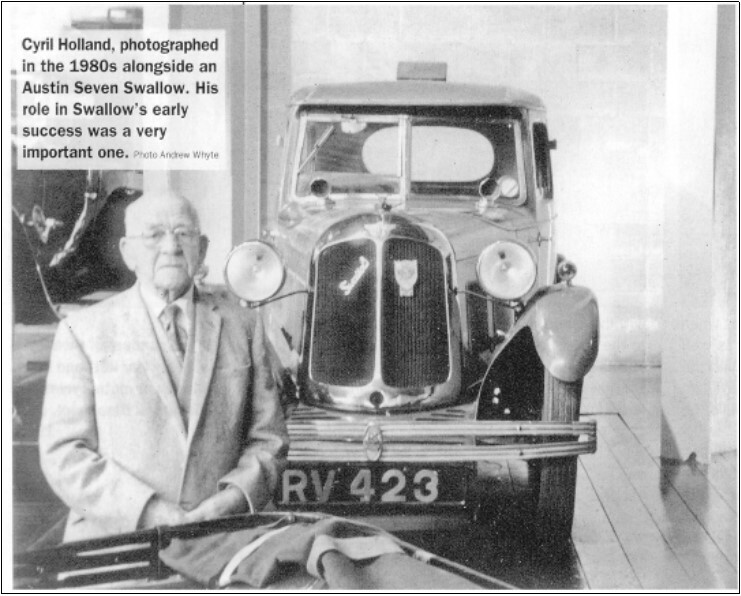 The outcome was the Austin Swallow Seven which appeared in the spring of 1927. A delightfully pretty car and usually finished in bright colours, it appealed mainly to younger people, particularly females. It was joined in 1928 by a saloon version and, underwritten by a huge order Lyons had obtained (to his great surprise) from Henlys, the company moved to Coventry in search of skilled labour. This produced a parting of the ways between Lyons and Holland who, once in Blackpool, did not want to uproot again - although it is quite likely that the independently-minded Holland felt that he was not being offered enough incentive to make the move. Lyons described the loss as "a terrible blow" and, indeed, when Swallow ran into problems with body frame manufacture, he did succeed in inducing Holland to return. From an article by Paul Skilleter in the magazine: “Jaguar Driver March 2007” with many thanks.